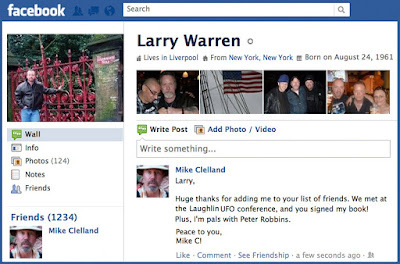 A screen grab of Larry's facebook page, featuring the number 1234! Click on the image for a HI-rez view. More weirdness with UFOs and the number 1234 involving one of my heroes, Larry Warren. Just a few minutes ago Larry added me to his list of friends on facebook. He plays a central role in the Bentwaters case from 1980, perhaps the single most well documented UFO case in history. He also wrote the book LEFT AT EAST GATE, along with Peter Robbins, about the Rendalsham Forest incident. I was noted as his latest friend, and now his list totals 1234. For folks who haven't dug thru this blog, I've had a LOT of synchronicities with the number 1234. Larry speaking about the events of 1980. Left At East Gate is one of the best UFO books I've read. I think my most favorite part is the transcript of the real-time audio recording Peter & Larry made during their first visit to Rendlesham; it really added an extra-layer of veracity to the case. Just a moment ago I was listening to Marie D Jones on the Paranormal Podcast and who should come up on my Facebook feed but Marie D Jones! On the show she was saying how we're all connected on the quantum level. Woo-woo! My husband shares a birthday with Larry. I'll have to check out Left At East Gate as well. Glancing through your site today and saw this, and it reminded me of the very day I met Larry Warren in the summer of 1995 or 1996 while at the Springfield, Missouri UFO Conference. My sister and I were standing outside the meeting hall chatting with Larry, when I noticed a shiny silver object hovering in the sky nearby the conference center. Although it was a breezy day, the object wasn't moving. It could have been mistaken for a mylar balloon that was magically floating stationary in the wind, but I could tell by looking through binoculars it was not a mundane object. I kept an eye on it for a good 10 or 15 minutes until it was time to go back in for the next speaker. My impression was, and still is, that the object was somehow drawn to observe the conference participants.